This might seem like a strange combination but just trust me on this one – it’s good. What was not good was my decision to start this risotto at 8:45 after I got home from yoga. I was so hungry I didn’t know if I’d make it through all the stirring! Risotto isn’t hard, it just requires constant attention and a block of time. 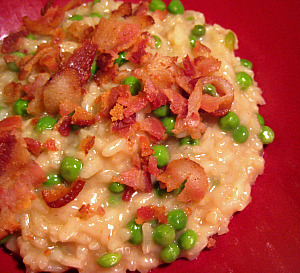 I was expecting this risotto to be a simple weeknight dinner but it really surprised me. The flavors green pea and bacon flavors were great together and the addition of lemon zest and juice at the end added an unexpected brightness. I also really appreciated not having to open a bottle of wine to make this dish! Unhappy to report that my left leg is not getting much better. After my run on Monday it was swollen and sore. Boo. I planned on running the RaceFest Half Marathon in April but that’s not looking good for me unless my leg starts feeling better. I’ve taken the rest of the week off of running but I’m going to test it out again this weekend to see how it’s feeling. The high here is 60 degrees on Saturday and Sunday and I can’t wait to get outside! It’s been such a cold and wet winter. I’m going to embrace the two days of nice weather to the fullest! And time for bed…up early tomorrow for my 6:30 hot vinyasa class. Can’t wait! Hope I’m not feeling too sore from BodyPump. In a separate heavy saucepan, cook bacon over medium heat until crisp. Transfer to paper towels to drain. Reduce heat to medium-low and add garlic to bacon fat in pan and cook, stirring occasionally, until pale golden, about 1 minute. Add rice, stirring to coat. Add 1/4 cup hot broth mixture and simmer briskly, stirring constantly, until broth is absorbed. Continue simmering and adding hot broth mixture, 1/4 cup at a time, stirring frequently. Make sure each addition has been absorbed before adding the next. Rice is done when tender and creamy but al dente, about 20-22 minutes. You might not have to use all of your broth but reserve leftover broth mixture to thin the ristotto before plating. Stir in cheese, butter, lemon zest and lemon juice. Thin risotto with some of reserved broth mixture if desired and season with salt and pepper. Top with bacon. I cut this recipe out of Food and Wine several months ago. I finally added it to our menu last week and all I can say is that I wish I’d have tried it sooner! The quick braising method results in very tender chicken and the flavors in this dish are great for something that comes together so quickly. 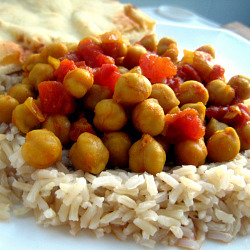 If you’re a fan of ethnic flavors, I definitely suggest you try this one out! Trim chicken breasts and season with salt and pepper. 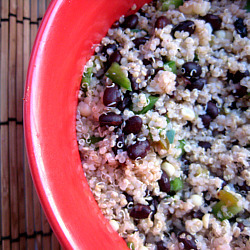 Lightly dredge in flour and shake off excess. Heat oil in a large skillet over medium-high heat. Add the chicken to the skillet and cook, turning once, until lightly browned, about three minutes per side. Transfer the chicken to a plate. Add the garlic, ginger, chile and bell pepper to the skillet and cook over medium-high heat until slightly softened, about 2 minutes. Stir in the curry powder and cook for 1 minute. Add the tomatoes, yogurt and water and stir until smooth. Return the chicken to the skillet and bring to a boil. Cover and simmer over low heat until the chicken is tender and the sauce is slightly thickened, about 15 minutes. Sprinkle the chicken with cilantro and serve over rice.